We revere them by remembering them. We celebrate them when we hold sacred their stories and their sacrifice. We honor veterans by recording their stories. Gene was eager to join the fight in 1943. He enlisted as a Marine at age 16. His World War II memories are many and varied, from lighthearted to painful. For decades he struggled with physical after-affects, and he still remembers remarkable details. At age 90, Gene is a willing and colorful storyteller. 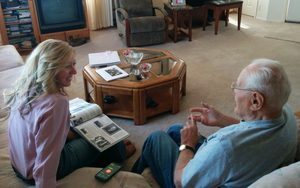 Read more of Gene’s stories about serving in the Pacific theater during World War II HERE. We know Gene’s stories because we asked. If you don’t ask the veterans in your family, who will? Don’t let their stories die with them. Happy Memorial Day. May we record so we never forget. *The writing/interview prompts for veterans are a bonus module within the Guided Tale Membership; join today for complete access to write your full life story or interview a loved one. “She counts not the cost of nights without sleep and days full of giving…” A Mother’s Day Tribute and FREE PRINTABLE!